Hello, my name is Lemondrop! I will make you feel like it`s a bright sunny day every time you look at me. I have just been freed from a two-year prison sentence in the warehouse of a large, chain, pet store. A kind-hearted employee (yes, some stores do have them) alerted Mickaboo to my plight--shared by my friend Vivaldi. You see, the store had decided not to sell canaries anymore (good! ), but instead of leaving us on display until someone purchased us, the store manager placed our cages in the warehouse (bad!) and there we languished with little care for two long years. We are an excellent example of why birds shouldn`t be sold in stores! When our rescuer first brought us back out in to the world we were very quiet and docile. To tell you the truth, it`s so bright out here! The sun, and the noise, and all the sights - we were a bit stunned! 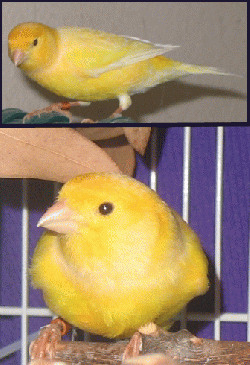 Our rescuer didn`t know that male canaries are very pugilistic with each other, so she had us in one cage and sure enough by morning the shock of being out of the warehouse had worn off and we were engaging in avian fisticuffs! Luckily our new foster mom knew what is best for us and now we are each happily singing in our own cages. I`m more than ready to start the next chapter of my life! The future`s so bright I`ve gotta wear shades!